Winter 2016 saw the momentous relaunch of the Hong Kong Queen’s Road JOYCE Central flagship store with “The Golden Needle” theatrical fashion exhibition. Tasked with creating an artwork to commemorate the milestone event, renowned British artist Nigel Weymouth returned home to London after attending the opening as a guest, to make a start on developing and completing his final piece: a screen printed poster of which only 100 editions exist. The iconic artist drew on his background as founder of 60s fashion mecca Granny Takes a Trip and one half of art duo Hapshash and the Coloured Coat. 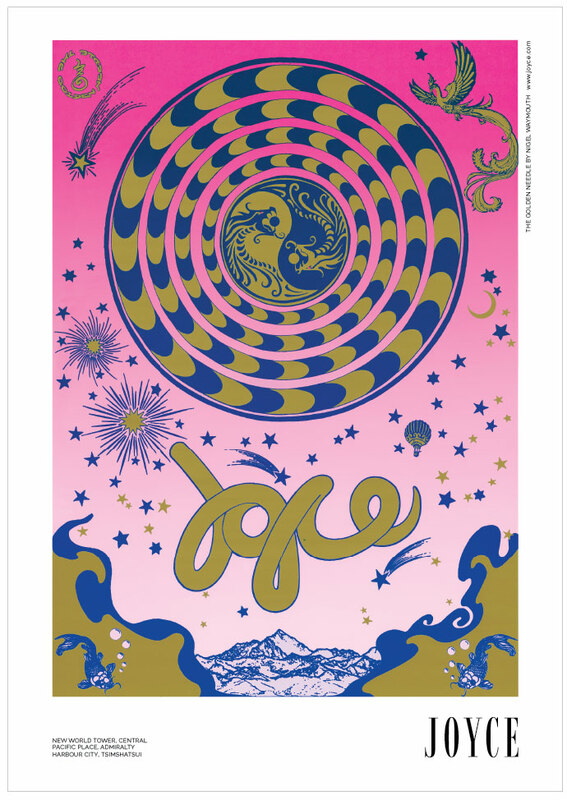 Responsible for many of the most recognisable concert posters and record covers of the time for Pink Floyd, Jimi Hendrix and Soft Machine, of which a selection are included in the permanent collection at the V&A Museum, Waymouth is no stranger to creating highly significant representations of culture, music and fashion. Starting with a panoramic image taken from the highest bar in the World, the artist took inspiration from the electric Hong Kong skyline at dusk, creating a neon pink starry backdrop for the poster. Carefully researched by Waymouth, each detail included in the screen print has symbolic meaning. The work features a phoenix for peace and prosperity, Chinese dragons to signifying strength and luck, and the circular dragon coil for longevity. “All the elements: water, air fire, earth, they’re all there.” And the hot air balloon? “Well, that’s the human touch”, explains Waymouth. The stunning final work entitled “JOYCE: The Golden Needle” will feature in an ongoing campaign for JOYCE in commemoration of The Grand Opening and the esteemed guests who attended the event. The official launch of Waymouth’s work will take place in July 2017 and will be supported by a dedicated JOYCE Cabinet installation with pieces of the artist’s work available for purchase.